Over the festive season last year I was lucky enough to get to eat (too many) of the most delicious spiced cherries in red wine from Bruny Island Cheese (club) and I have been chasing that taste ever since. Cherries are one of the most versatile fruits, great fresh, stewed, jammed, savoury or sweet, and always delicious. 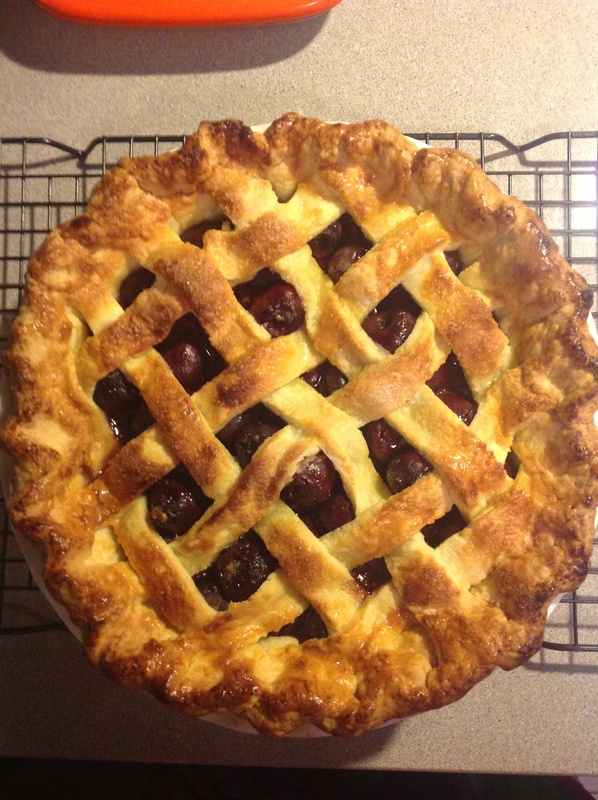 For this pie I borrowed the amazing cherry pitter from S-J and took to gutting my cherries with maniacal glee (pro-tip: don’t wear a white shirt while you pit 1kg of cherries, it’s a blood bath). Full disclosure, I have not mastered the pitter and did have to issue a warning to my test-eaters to be on the lookout for stray pits – only 7 were found in the whole pie so that’s about a 95% success rate, I’m calling it a shaky win. I used Smitten Kitchen’s Pie Dough 101 but did the whole thing in the processor to save my bench top. If you make your own dough, ensure that it is chilling in the fridge while you make the filling, if you’re using store bought frozen dough, make sure it’s defrosted in the fridge (needs to be pliable to line the dish). Pick over your cherries and remove any stems and nasty fruit. Use your pitter (or a knife – be careful!) and remove all pits. In a large bowl stir together all the pie ingredients except the butter. Mush the cherries a little as you go to release their juices. Enjoy your delightfully pink fingers and attack the cat with them. It’s good if you forget you have cherry fingers and wipe hair out of your face and discover the red smear hours later and give yourself a fright. Roll out half of the chilled dough between two sheets of bake-paper to about 14-inch round (I never roll things perfectly round, but good luck to you). Ease it into your pie plate – remove one of the sheets of bake paper, flip the dough into the pan and use the edges of the paper to help ease the crust in. Press the base and corners to make sure there are no air bubbles. Trim the edges leaving an overhang of about 2 cm. Pour the filling into the crust. I like a gooey pie – if you don’t you may like to hold back some of the liquid in the bottom of the bowl. Chop your butter into small cubes, scatter those on top of the filling. Roll out the remaining dough the same way, cut into 2cm strips and layer half across the pie, leaving 2cm overhang. Take the remaining strips and weave to make the lattice. Fold the overhang under the bottom crust, pressing the edge to seal it, and crimp the edges together. Using a pastry brush, egg wash the pie crust, then sprinkle sugar over the top. Bake the pie on the middle rack of the oven for 25 minutes. Reduce the temperature to 175C. and bake the pie for another 20 – 25 minutes, or until the crust is golden (if it starts to brown on top too quickly, tent with tin foil and continue baking). Remove from the oven and allow to cool. I think this pie is about 200% more delicious after a night in the refrigerator and is excellent served with whipped cream and/or vanilla bean ice cream. A lemon zest infused marscapone would also be pretty delish! also, you remember the cherry balsamic we bought at the markets that time, that i used with the duck… YOU COULD TOTALLY MAKE THIS WITH THAT!